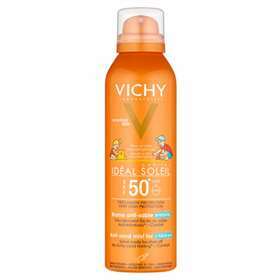 Vichy Ideal Soleil Anti-Sand Kids SPF 50+ mist spray is an easy to apply, non-sticky, dry finish spray which allows sand to be easily brushed off. This water-resistant sunblock is visible when first applied to help ensure full coverage, keeps skin hydrated and fights against free radicals caused by exposure to the sun. Vichy Ideal Soleil absorbs or reflects UVA and UVB rays to protect skin. Ideal for children with easy spray application and anti-sand stick. Apply this product thoroughly just before exposure. Re-apply frequently and generously to maintain protection, especially after swimming, perspiring or toweling. Be aware, this product does not give 100% protection. Avoid contact with eyes. If contact is made wash eye well with clean water. Pressurised container: may burst it heated. Keep away from heat, hot surfaces, sparks, naked flames etc. Do not spray near an open flame or ignition source. Do not expose to temperatures exceeding 50 degrees C.
Avoid spraying near eyes, any skin irritation or deliberate inhalation. Do not spray in an enclosed space. Do not use this product for anything but sunblock. Butane, Aqua/Water, Dicaprylyl Ether, Homosalate, Drometrizole, Trisiloxane, Ethylhexyl Salicylate, Dimethicone, Styrene/Acrylates, Copolymer, Octocrylene, Butyl, Methoxydibenzoylmethane, PEG-30 Dipolyhydroxystearate, Nylon-12, Dicaprylyl Carbonate, Methyl Methacrylate Crosspolymer, Cyclohexasiloxane, Polymethylsilsesquioxane, p-Anisic Acid, Caprylyl Glycol, Disodium EDTA, Disteardimonium Hectorite, Dodecene, Ethylhexyl Triazone, Isododecane, Isostearyl Alcohol, Lauryl PEG/PPG-18/18 Methicone, PEG-8 Laurate, Phenoxyethanol, Poloxamer 407, Poly C10-30 Alkyl Acrylate, Propylene Carbonate, Sodium Chloride, Tocopherol.